BOAT OF DREAMS told visually in the captivating style of Rogério Coelho is a book full of wonder. Without words the beautifully-detailed pages offer a number of possible stories about an old man, a drawing, a flying boat and a young boy. The illustrations done in a rich sepia tone first show an old man asleep inside his cabin as the sun starts to peek through the window slats. Awaken by a seagull he puts on his glasses, gets dressed and goes outside. From his cabin, which is situated on a sandy beach, the man spies a bottle that has washed up on shore with a piece of paper inside and retrieves it. Returning to his cabin, which is full of maps, old radios, paint brushes and books, the old man takes the paper out of the bottle but it’s blank. He decides to fill the paper with a drawing of a gorgeous flying boat equipped with sails, flags and wheels. He places it in the bottle and returns it to the sea. The next pages, drenched in blue and white, depict a young boy finding an envelope on his front porch. He opens it and sees that very drawing of the exquisite flying ship! He takes a blue pen and draws in a picture of himself and his cat at the helm of the boat, tapes the picture on the wall over his pillow before bed and falls asleep. The next day, with the picture on board, he navigates the flying boat to the beach where the old man is waiting. They joyously wave, talk and hug. Then the boy leaves the picture with the old man and flies away in the wondrous boat. At night the old man with the picture over his pillow falls asleep as the candle goes out. In the morning the young boy wakes up to a beautiful sky-blue day-----leaving the reader to figure out who was the old man and who is the young boy. 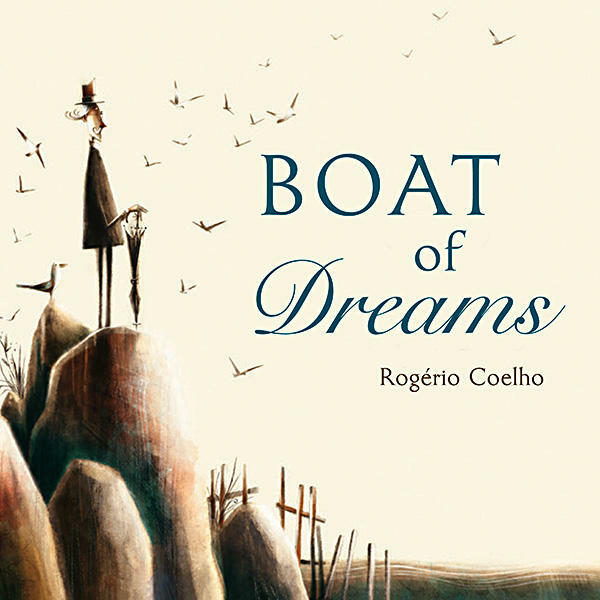 BOAT OF DREAMS by Rogério Coelho is rich in visual literacy opportunities and perfect for imaginative readers ages 8-10 and up (Tilbury House Publishers, 2017). Who could the old man be? Who could the young boy be? Could the man and the boy be related? Does the boy exist in the memory of the old man? What role do the seagulls play in this book? What could the storyteller/illustrator be saying? How does the landscape where the old man lives differ with the landscape in which the young boy lives? Look at the colors, the space, the sky, the birds and the buildings. What items can be found in both the cabin of the old man and the house of the young boy? How could these items reveal a storyline? Can you come up with your own title for this book that fits your interpretation of it? Use your imagination. Remember, it is your interpretation and your title. Go for it!